A mother's love is an example of God's great and sacrificing love for us. For many people, moms shaped their lives and brought them to a saving knowledge of Jesus Christ. 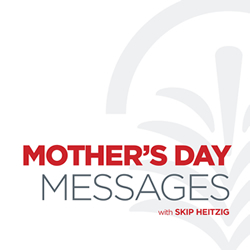 This collection of messages includes Mother's Day teachings and other topical messages about moms, who hold a special place in the heart of God. A mother's love is an example of God's great and sacrificing love for us. For many people, moms shaped their lives and brought them to a saving knowledge of Jesus Christ. This collection of messages focuses on these important women, who hold a special place in the heart of God. A Mother's Prayer - Luke 1:39-56 from our study Mother's Day Messages with Skip Heitzig from Calvary Albuquerque. A Hero In Your Own Home! This summer portends to be the year of the Super-Hero: Spiderman, The Transformers and the Fantastic Four all are making their reappearance to save the day! But there's another hero we honor today (or should we say heroine). In fact she probably already cooked you breakfast this morning! It’s the woman of the home—Mom! Today we pay tribute to this unique individual who helped to transform our lives. Timothy demonstrated genuine faith and loyalty to the Lord, and Paul the apostle credited these traits to how Timothy was raised by his mom and grandmother. As we examine Paul's second letter to Timothy, we discover three important ways that moms can invest in their children so they will fear the Lord and desire to serve Him with their lives. Today we pay a special tribute to those unique individuals we call our mothers. They have given us life on this earth, and their influence has transformed our lives. We will consider a woman from the Old Testament who became the mother of the prophet Samuel. Her name is Hannah and her name means favor or grace. Despite difficult circumstances, Hannah was shown favor by God. Let’s glean some insight from this wonderful woman as we honor our own moms today. First celebrated in a church in 1908, Mother’s Day quickly became a national observance. On this day we give honor to those unique women we call our mothers. But perhaps the most unusual mom ever was one from the pages of the Old Testament named Deborah. Her interesting blend of personality and giftedness not only impacted her own family but her nation as well. Notice five characteristics of this most interesting mom in the world.